At our February meeting we draped our Charter in memory of Amy Whitcomb, a long-time and well-loved member of our Grange. Many Grangers wore their sashes at her memorial service held on February 7th in Cornwall. Taghhannuck Grange again meets twice monthly starting this month at 7:30. The Graces will present the program on March 8th with Anything Goes. Margaret Hopkins will present An Aerial Update on March 22nd. 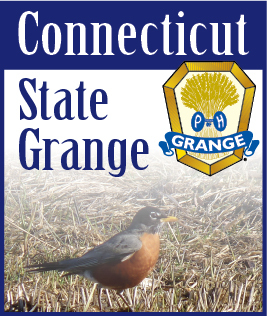 Members loved the article “The Grange Chair” in last month’s issue of the Granger. It brought back many memories about past Grange meetings. Our Grange has 33 chairs thanks to Stuart Prindle of Prindle Insurance Agency and sadly some from Granges that closed. We have members (and chairs) that came from closed Granges in Kent, Warren, Cornwall and Sharon (Silver Lake & Webetuck) and we found one chair in Falls Village with no idea who donated it.